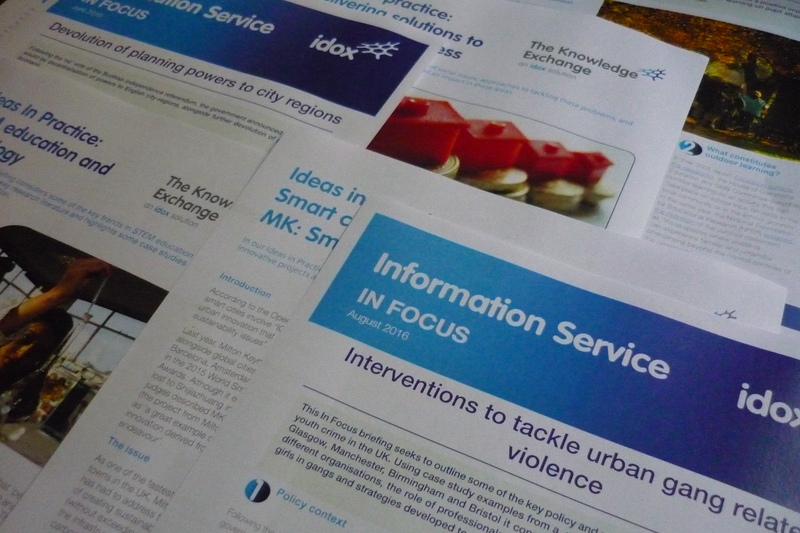 So far this year, our team of Research Officers in The Knowledge Exchange have researched and written more than 30 policy and research briefings on a diverse range of subjects, from housing and planning to technology and training. Written in a clear and concise style, each briefing brings together examples of recently published evidence, alerts readers to new and continuing developments and signposts sources of further information. New briefings are available exclusively to members of our Information Service, and the choice of topics is driven by what our members are asking us about. Today’s blog post offers a flavour of just some of the topics we’ve been covering during the year. 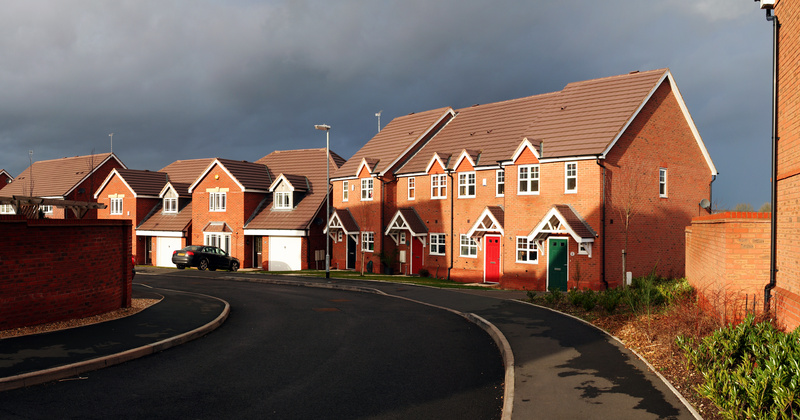 In many parts of the UK, people are struggling to buy or rent affordable housing. One consequence is a rise in homelessness. Our briefing – Delivering solutions to tackle homelessness – describes the complexities involved in defining homelessness, and the subsequent difficulties in measuring the scale of the problem. The causes of homelessness are no less complex, and the briefing lists some of the factors that lead to people finding themselves on the street, such as eviction, unemployment, health problems and relationship breakdowns. It also highlights approaches to tackling homelessness, such as social impact bonds and homeless health peer advocacy. Closely related to housing is the role of planning in ensuring that individuals and families not only have adequate homes, but the infrastructure and services needed to support communities. One of the significant developments in this area has been the UK government’s policy on devolving more powers (including planning) to England’s cities and regions. Our briefing – Devolution of planning powers to city-regions – explains that each devolution deal agreed between the UK government and local authorities is tailored to the local area. 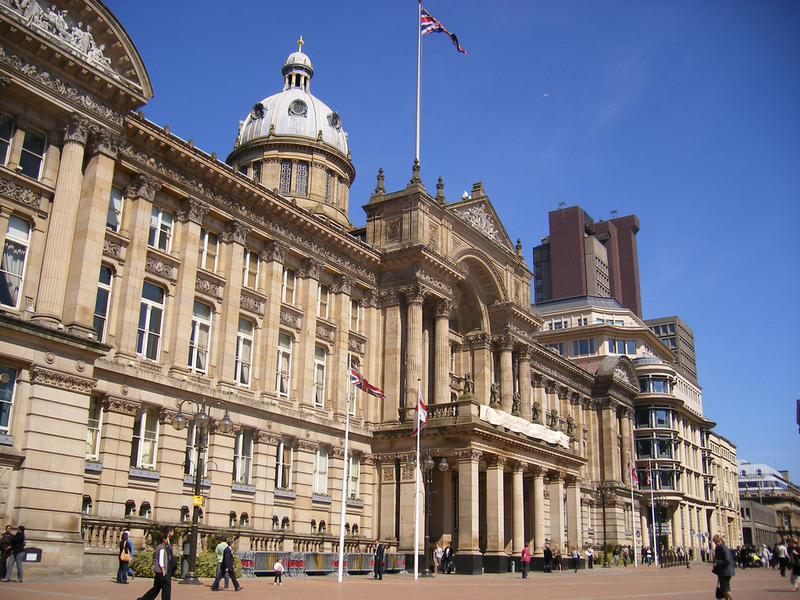 In the West Midlands, for example, a directly-elected mayor will be given planning powers to drive housing delivery and improvements. The briefing notes that, while there is widespread agreement that devolution of planning powers to local areas is a positive step, there is also concern that local areas won’t be able to deliver what they need to in terms of planning without control of expenditure, much of which is still retained by central government. Our “Ideas in Practice” series of briefings presents case studies of projects and initiatives that have tackled a range of social issues, often resulting in reduced costs or improved efficiency. Our smart cities briefing on MK: Smart outlines a technology-led urban innovation project in Milton Keynes that aims to improve the town’s key infrastructure in areas such as transport, energy, and water. One of MK:Smart’s success stories is its Smart Parking initiative, which has encouraged drivers to use limited parking spaces more effectively, as well as providing the council with a better understanding of parking behaviour. Another technology-focused briefing looks at the increasing development of “serious games” in the domains of planning, education, health and cultural heritage. Serious games in the policy field have borrowed elements from the video games sector, such as virtual reality, simulations and digital game-based learning. As well as improving skills and engagement among individuals, serious games have been used as a powerful way of introducing new concepts to the public, and providing people with an understanding of different points of view. The briefing showcases some examples of the application of serious games, including ‘B3— Design your Marketplace!’ which created an immersive and playful environment to encourage citizens to give their views on the design of a marketplace in Billstedt, a district of Hamburg. A number of our briefings this year have focused on the all-important areas of education, training and skills. The Ideas in Practice briefing on science, technology, engineering and maths (STEM) education considers key trends and practical applications. Among the initiatives highlighted in the briefing is Third Space Learning, which connects primary schools in England and Wales with maths specialists via one-to-one online sessions. In August, we published a briefing focusing on the impact of outdoor learning on educational attainment. It includes information on the implementation of the Forest School initiative in the UK, which places emphasis on children having contact with nature from an early age. The briefing highlights evidence that pupils with the highest connection to nature have been found to perform better in exams, and notes the positive impact on the attainment of those from deprived backgrounds. Our briefing on urban gang crime highlights some of the ways that local authorities and organisations have sought to tackle the problem. One of the case studies focused on the exploitation of young women by gangs in Manchester. Delivered by women who have survived gang exploitation, it provides one-to-one support, allowing both mentors and victims to create lasting relationships and networks of support which help them as they transition from life within a gang. In 2013, the project won the Women in Housing award for best community/ training project for its work in rebuilding women’s lives. This is just a taster of the variety of subjects addressed in The Knowledge Exchange’s policy and research briefings. 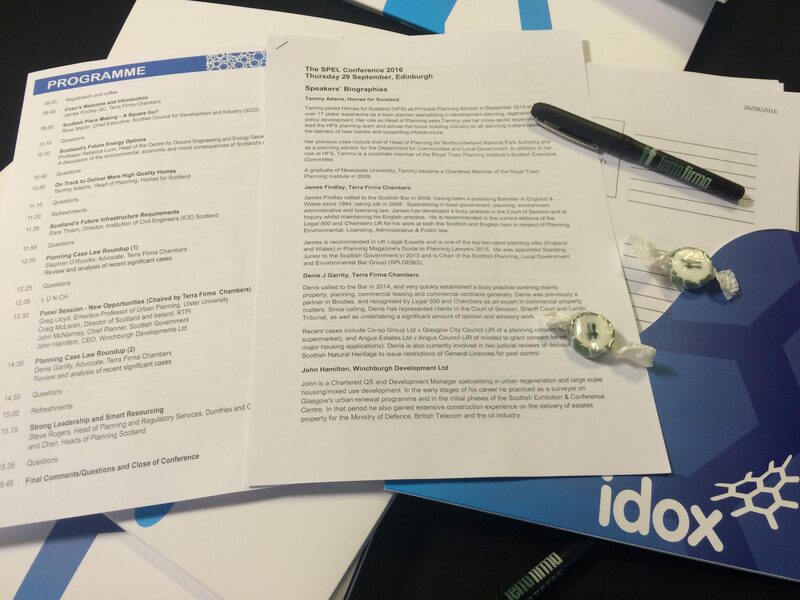 A fuller list of briefings is provided here, and members of the Idox Information Service can keep up-to-date with newly-published briefings via our weekly Bulletin. 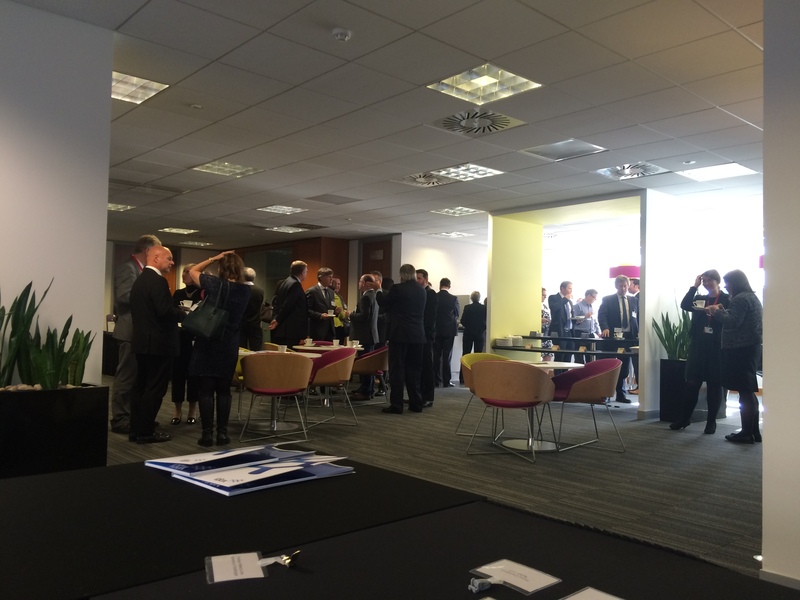 Delegates came together in the COSLA building in Edinburgh to discuss all areas of planning and environmental law in Scotland. The gathering included a range of organisations and sectors, including lawyers and solicitors, planners, engineers, academics and civil servants. The morning session focused on energy, infrastructure and economic development. Ross Martin (@SCDIChief), chief executive of the Scottish Council for Development and Industry kicked the day off with a discussion of place making in Scotland. He highlighted the economic benefit of good planning, noting that when it is done well planning has a core role in economic development strategies and can facilitate growth within an area. This was followed by a discussion from Professor Becky Lunn from the University of Strathclyde who gave delegates some interesting food for thought in her discussion of the environmental, economic and moral consequences of Scotland’s energy choices. A day after Ineos imported its first container of US shale gas to its Grangemouth refinery, Professor Lunn told delegates, that no energy solution is problem free, but “if we (Scotland) say no to the domestic production of gas and nuclear energy we are saying yes to something else”- the demand needs to be met regardless of whether the energy is produced in the UK or not. She questioned the moral arguments that it could be acceptable to import shale from elsewhere, while we are not content enough with the level of safety, the security of regulation and its wider environmental impact to do it ourselves (something which was picked up on by Ruth Davidson later that same day in FMQ’s). Professor Lunn advocated a strong public element to discussion, and a robust and well-informed debate around long term energy choices. She also warned against “crisis led” energy policy-making dictated by rhetoric of “fear and shortage”. Head of planning at Homes for Scotland, Tammy Adams (@TammyHFS) discussed the delivery of high quality homes in Scotland within the wider planning context. She highlighted the challenges and opportunities for house building, arguing that delivering new homes in Scotland should be “a golden thread” running through the Scottish planning system, and that an effort should be made to better align market realities and site strategy, but maintain flexibility of delivery. The penultimate session of the morning was delivered by Sara Thiam, director of the Institution of Civil Engineers Scotland. She looked at the role of infrastructure and planning. Sara discussed the potential of devolution to city regions to grow the economy by allowing city regions to plan and build infrastructure which reflects their local social and economic needs. She also spoke about the need to be strategic about infrastructure choices, not just pushing increased finance for infrastructure, but targeting it strategically, investing in green infrastructure where possible, and thinking long-term about projects and desired outcomes. The morning was brought to a close by event sponsors Terra Firma Chambers who provided some useful insights into up-to-date case law, including notable cases that many delegates could draw on for their day to day decision making and planning submissions. The afternoon session opened with a panel session which featured insights from four speakers: Greg Lloyd, Emeritus Professor of Urban Planning at Ulster University; Craig McLaren, RTPI Director of Scotland and Ireland; John McNairney, Chief Planner at the Scottish Government; and John Hamilton, CEO Winchburgh. The discussions focussed on the new opportunities presented in planning in Scotland, including the review of planning, building homes, creating more joined up planning and the planning process more generally. Discussions were wide ranging, generating a lot of interaction both within the panel and between the panel and the delegates. The discussions were wrapped up by a second case law update. The final presentation of the day was delivered by Steve Rogers, Head of Planning and Regulatory Services at Dumfries and Galloway Council and Chair of Heads of Planning Scotland. He spoke about his experiences with smart resourcing and the importance of leadership in planning. Overall it was a day full of insight and expertise, which provided everyone who attended with the opportunity to think critically about the state of planning in Scotland from a number of different positions. It posed questions to be considered, allowed delegates to reflect on their day to day practice and highlighted opportunities and potential barriers for planning in Scotland in the future. In 2015, one third of local councils were still running Windows XP, months after a public sector-wide support agreement came to an end. By failing to update their systems, these local councils increased their vulnerability to cyber-attacks, potentially risking the loss of data. Although many would argue that not installing a supported operating system is a minor risk, it does highlight a more fundamental issue with local government: whether it’s making simple upgrades or delving into advanced ‘smart city’ technologies, local government is struggling to keep pace with the digital world. Why should local government invest in digital? Local councils in England are facing a 6.7% cut in their funding by Whitehall between 2016-2020. It’s expected that the majority of the cuts will come in the first two years, easing off in the remaining two. Additional funding measures have been put in place for social care, including enabling local councils to raise £2 billion by increasing council tax and providing access to £1.5 billion from the Better Care Fund (BCF). However, Chair of the Local Government Association (LGA), Lord Porter, has emphasised that social care will not see the benefits of this funding for a decade and in the short term, services will still be under pressure. So, with this challenging financial context, local government is looking to redesign services, to create efficiencies and improve the experience for citizens. Embracing digital could provide some solutions. Where could digital be adopted? According to the National Digital Report, local councils are wasting two million man hours per year by re-keying data they receive through online services or a customer relationship management (CRM) system. The research shows that 50% of local councils are re-keying more than half of the data they receive via e-forms, creating £14 million in waste. It’s estimated that 11% of local councils are re-keying all their data. In addition, a report by independent consultancy Bluefin Solutions has found that if local councils improved their access to mobile technologies, they could save £10 million per year. Chris Smith, Head of Public Sector at Bluefin Solutions, suggests that allowing council employees to access information via laptops and other mobile devices is an ‘untapped’ opportunity for council leaders. The report provides further detail, highlighting that local councils should allow staff to complete timesheets via mobile devices, engage with collaborative platforms, digitise data, and introduce a Bring Your Own Device (BYOD) policy. These are just a couple of examples of where technology- enabled savings could be made in local government. Sounds great! 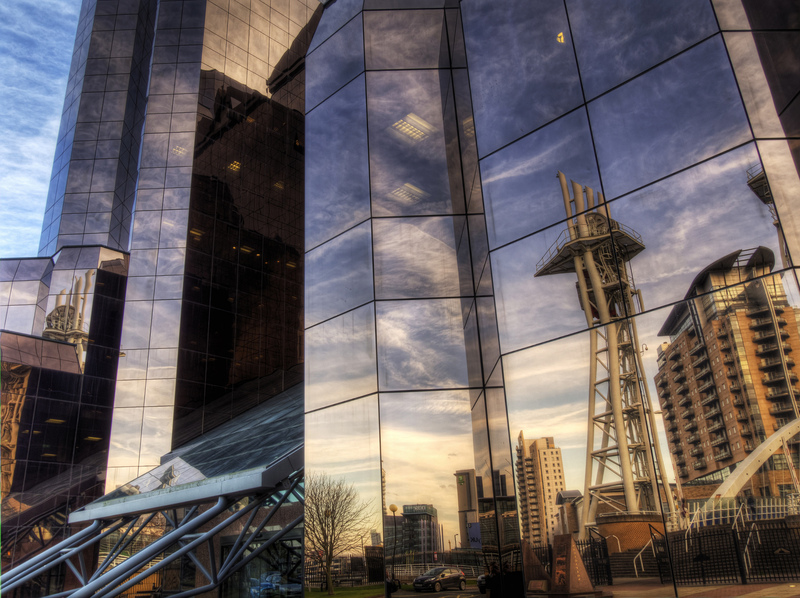 Why hasn’t local government implemented more digital solutions? Although there are a number of initiatives to improve broadband services across the UK, a lack of connectivity is still an issue, particularly in rural areas. For smart city projects, Wi-Fi infrastructure needs to be in place to support millions of sensors and connected devices. And in remote communities, local councils need basic broad infrastructure to ensure they can implement digital solutions such as cloud services, as well as encourage mobile working. Unlike the private sector, local councils often face challenges with red tape and providing a business case, especially when investing in unproven technologies. Interestingly, though, the Local Digital Today 2014 report found that the need to provide a business case for digital projects has slightly declined (falling from 85.4% in 2013 to 78.3% in 2014), suggesting that maybe digital technologies are gradually becoming more acceptable in local government. However, for the majority of local councils providing a clear business case can act as a barrier to digital change. In theory, providing technical solutions to local government services should provide long term efficiencies. Yet, in an era of constrained budgets, finding the initial capital for digital projects can be challenging. Leaders in councils trying to fund social care services and schools may not view digital as a priority. And with the legal obligation to set a balanced budget, under the Local Government Act, councils are unlikely to fund projects with debt. Seeking external investment can also be a challenge, as (unlike start-ups looking to develop new technologies) local councils are unable to work with private sector organisations such as venture capitalists. Local councils have also received no digital funding from the recent Autumn Spending Review – with all £1.8 billion being allocated to central government departments. Martin Ferguson, Director of Policy and Research at Society of Information Technology Management (Socitm), argues that investing in digital health without investing in digital social care means that efficiencies and improved outcomes for citizens will not be achieved. The public sector has been scarred by failed high profile IT projects, including the abandoned NHS patient record system, which cost the taxpayer nearly £10 billion. As a result, local council leaders have tended to be risk averse and avoid investment in major digital projects. Additionally, public concern over privacy, an issue raised when national ID cards were considered, has also impacted enthusiasm for digital. Even exemplar digital nations such as Estonia are underpinned by departmental data sharing agreements, which the British public may not be comfortable with. Research has also shown that a limited understanding of smart cities by the public, has led to a lack of support. Local councils have therefore been reluctant to invest in projects that have limited demand. In the Policy Exchange’s Smart Devolution report, co-author Eddie Copeland suggests that devolution might provide the tools to encourage greater digital progress. In particular, he highlights the ability city authorities will have to pool together funding from separate pots, co-ordinate initiatives at a city-wide level, and exploit the benefits of data through a designated Office of Data Analytics. 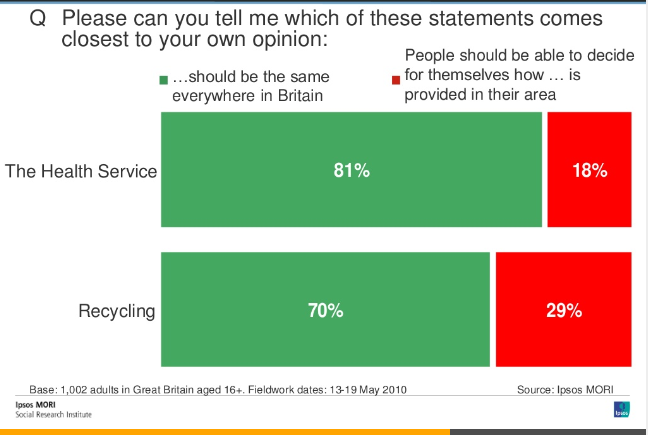 This won’t entirely address why local government has struggled with digital change. Yet, it’s possible devolution will provide greater opportunities for local government to embrace the digital world. Either way, it will be interesting to see what role digital plays in devolution deals, and how this will impact the lives of citizens. Follow us on Twitter to see what developments in policy and practice are interesting our research team. Further reading: if you liked this blog post, you might also want to read our other posts on digital. 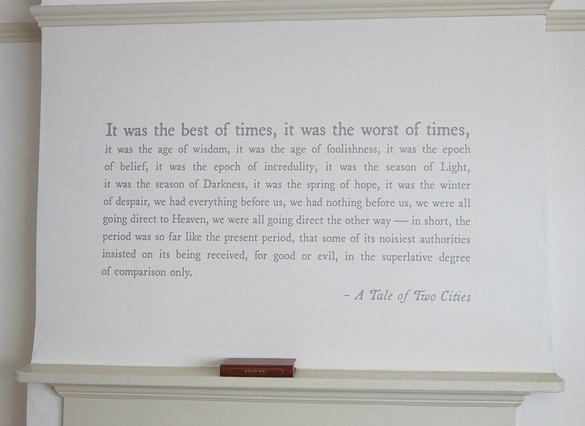 In his classic quote, Dickens describes a time of great change, and the conditions which were forcing that change: industrial and technological revolution; growth in knowledge and education; oppressed conditions of the working class and lack of hope within a time of great progress. In France this led to revolution, in Britain it led to eras of philanthropy, growth in a new middle class, and extensive governmental and democratic reform within a broader struggle by the establishment to retain power. Today, we are faced with similar conditions: huge technological change; growing inequality; uneven distribution of power and funds – but the demand for change is coming from the cities and local leadership, not from an oppressed working class. This is creating a resurgence in the call for greater devolution, which has gathered speed since the end of the 20th century. 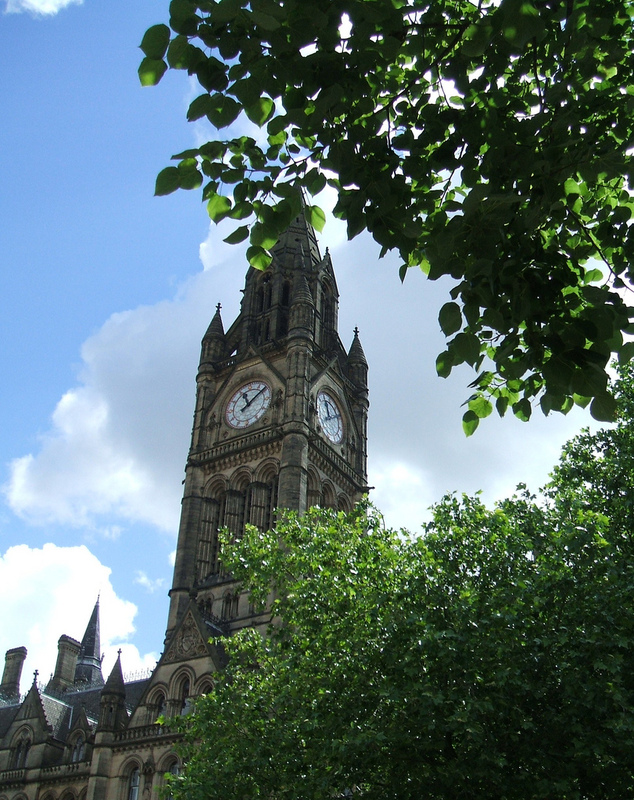 So what are some of the arguments for and against devolution, and what will be the impact? Currently Britain has a patchwork of devolved powers, with devolved nations having greater control over local issues. Here local government already makes decisions on local issues and this ensures discussions and decisions are made at the appropriate spatial level. However, unlike other countries such as Canada, this is a combined self- and shared- rule, with central government still able to legislate in the devolved areas (in practice they don’t without the consent of the devolved government). This does, however, lead to one of the greatest arguments for further devolution, as England does not have a similar structure and there is no opportunity for any self-rule. In demographic terms, areas such as Manchester and Wales have similar populations, but Wales has much greater control over its own destiny. This concentration of effort can streamline the decision making process as decisions are made by the people who know the issues and can implement the solutions. National government is freed up to discuss issues of national importance and the ‘bigger picture’. 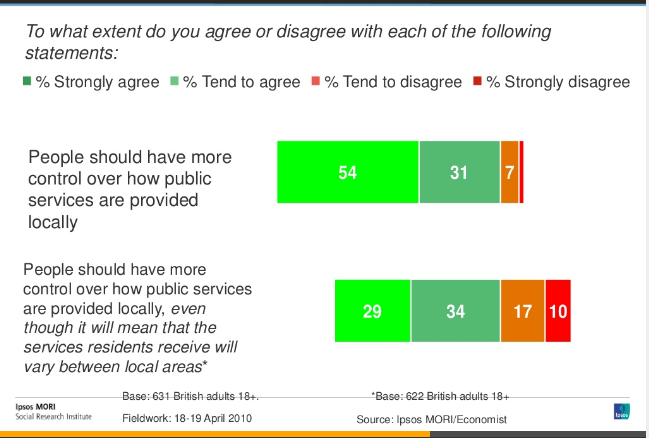 There is also the potential that decision making at a local level is more effective, because of the greater belief in a common goal by decision makers as they focus on the enhancement of their own local area. Currently the devolved nations don’t have their own tax raising powers and are still funded via a block grant from central government. Greater powers over taxation could lead to greater competition and ensure money raised in an area is reinvested in that area. However, this could also continue to widen the gap between rich and poor areas. One of the arguments against devolution is cost. Devolving decision making from a central system, which has been doing this effectively for a long time, would increase the time taken for decisions and the associated structure changes needed to implement them. And there is a possibility of constitutional instability. What happens if the city or regional government clashes with national government? How does this get resolved? Who do we appeal to? National government? Current devolution structures are not all the same. Scotland has control over policing, Northern Ireland doesn’t. In Wales some powers are devolved to the assembly not the government, so structures, powers and legislation varies, and therefore the devolved governments are not all equal. This uneven devolved decision making can also lead to a postcode lottery. One of the starkest examples of this is university tuition fees, where a student in England looks at debts in excess of £27k for fees, while Scotland has not introduced them. Many also see devolution as the start of the break-up of the United Kingdom which would lead to a weakening of the national government, and its position in world politics. The recent Scottish referendum which asked “Should Scotland be an independent country?” returned a no vote with a 10% majority, on an unprecedented 84% turnout. Other referendums on devolution-related topics have fared less well on voter engagement: the Greater London Authority was established with a 72% majority on a 34% turnout; and the last limited devolution referendum in England was in the North East in 2004, where it was rejected, by nearly 80% of voters on a 47% turnout. Ensure a fair, place-based spending approach, which invests in places without widening the gap between them, and is balanced by social justice. There are clear arguments for and against devolution, and whereas Dickens popularised political discussion in the nineteenth century by creating a narrative people related to (serialised in ‘cheap’ papers which the growing educated population and new middle classes could access) the majority of the electorate today is not engaged in these discussions. In the run up to the general election, there is a lack of populist narrative about devolution and, as a result, change could be implemented without full democratic participation and an understanding of the impacts. The Idox Information Service can give you access to a wealth of further information on devolution, democracy and political engagement. To find out more on how to become a member, contact us.